We are excited to share the preview availability of our Python packaging (PyPI) capabilities for Azure Artifacts and would love for you to give it a try. Our team spends a lot of time surveying and listening to our customers to learn about their needs with regards to Azure Artifacts (packaging). In our research, it became evident that PyPI support was our most requested packaging type. This finding has motivated the hard work behind getting the PyPI feature ready for release. Create a feed(s) associated with your project to store your packages. Upload Python packages to your feed using twine, flit support is being tested. Pull packages from your feed using pip. 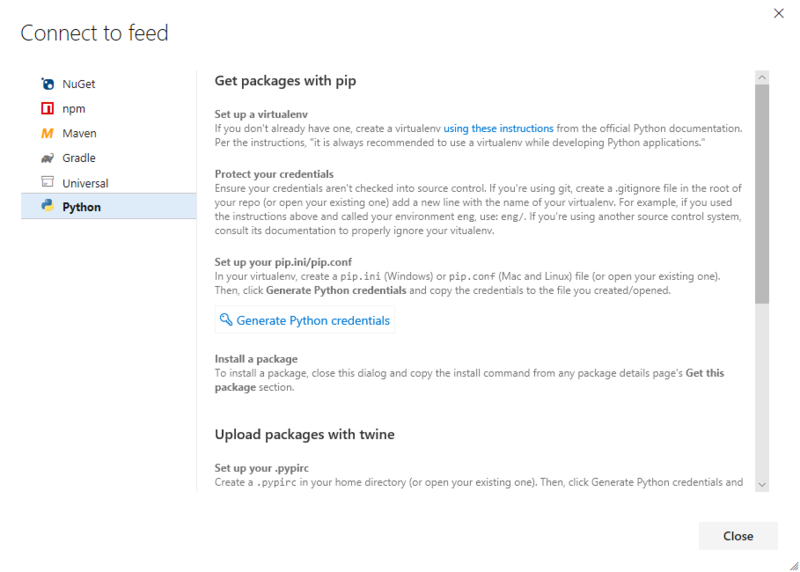 Integrate Python packages into your Azure Pipelines CI/CD using a task that simplifies the authentication for you. Include packages from the public index into your feed (Upstreams). Please note that this feature is in preview, which means we’re currently still fine tuning it. We would love to hear feedback on your experience and how this functions within your workflows. We’d love your input! Help us figure out what to work on next by sharing your thoughts and feedback on our developer community forum. Additionally, if you’d like to reach out directly with thoughts or feedback, please comment below. I’d love to hear your thoughts. To learn more, you can also visit the Azure Artifacts product page.